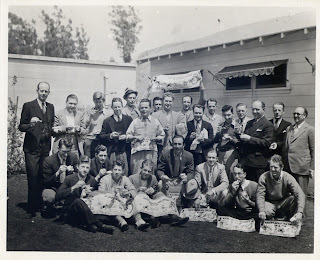 Here is a great staff photo taken sometime I think in the mid 30s to promote MICKEY MOUSE ICE CREAM. If anyone can put a date to the photo and identify some of the unknown faces I would love to hear from you. Those that I can identify (hopefully correctly) Back row left to right: Frank Churchill, Leigh Harline, Wilfred Jackson, Norm Ferguson. Front second from left looks like Fred Moore and just behind him Les Clark. Second from right still in front looks like Pinto Colvig. My feeling this is 1935 sometime as Donald can be seen on the banner. I'm back with more photos. 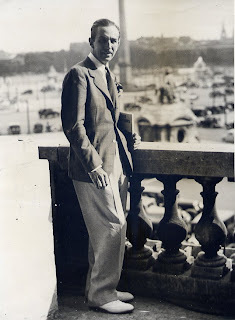 Walt Disney, whose animated cartoons are known throughout the world, came to Paris for a rest. This first thing that greeted his eye was a copy Les Trois Petit Cochons (Three Little Pigs to you). They can be found by the dozens (in book form) in any French railroad station.